Apparently I am expected to write a report on the RS Aero racing in the regatta at my sailing club the other weekend. So what do you want to know about America’s favorite RS Aero regatta? What? You don’t believe that it is America’s favorite RS Aero regatta? Well, first of all I read it somewhere on the Internet so it must be true. And second of all, RS Aero sailor Michael Housley drove all the way from Maryland and back on a weekend when the country was being battered by Hurricane Irma. That’s about a 900 mile round-trip. That’s dedication! Why would he come all that way in a hurricane if this wasn’t America’s favorite RS Aero regatta? And fourth of all, you should have heard the speeches made by the winners of each class at the awards ceremony about what a special place Massapoag YC is and how much their classes enjoy coming to race here. (Oh sorry, didn’t I mention that there were also 57 boats from 5 other classes racing at this regatta?) If you heard what these folk had to say you would have to conclude that it is everybody’s favorite Laser and Sunfish and Flying Scot and Comet and Day Sailer regatta too. You might think it would be a bit crowded racing on a small lake with all those other boats, but generally it wasn’t. 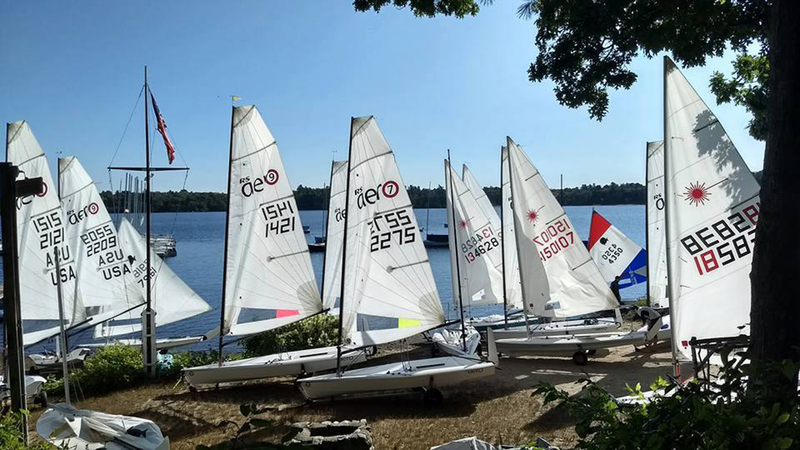 Our ace PRO Gary Werden did a great job of sending off the fleets to alternating sides of the trapezoid course and everybody was feeling Massapoag Mellow (not to be confused with Mellow Yellow) so there wasn’t any inter-fleet argie-bargie. It is true that we could sometimes hear the bleats of the Laser sailors griping at each other from the far side of the lake, but you have to feel sorry for them really. They are still sailing Lasers, bless their hearts. What’s that you say? You want to hear about the actual racing in the RS Aero fleet? OK – you asked for it. 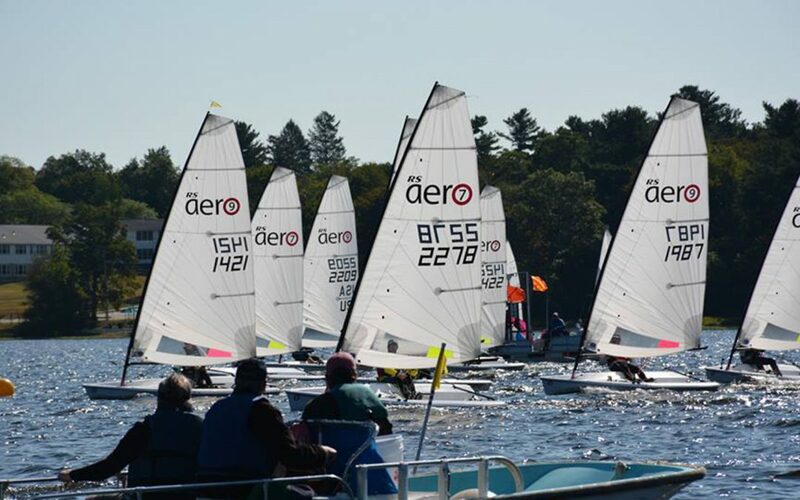 There were ten RS Aeros and we sailed ten races – six on Saturday and four on Sunday. Five of us were in 9 rigs and five were in 7 rigs and we were scored on handicap using the RYA Portsmouth Yardstick ratings. 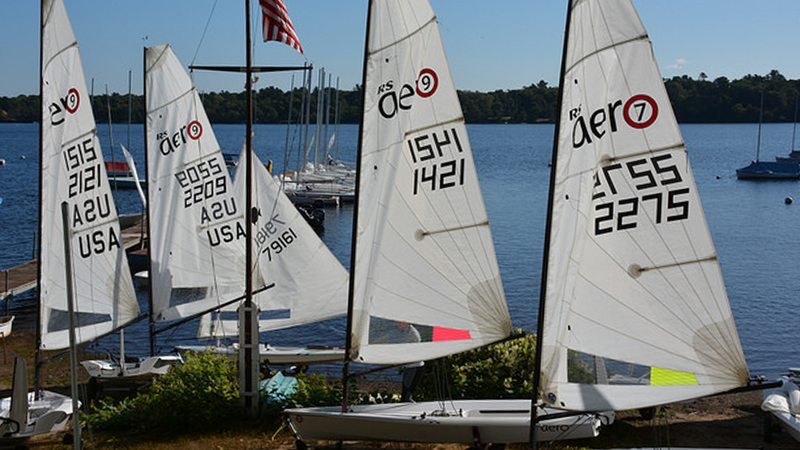 Four different sailors won at least one race on handicap. Six races were won by 9 rigs and four races were won by 7 rigs. Five different sailors beat the current RS Aero 9 World Champion in at least one race. (Modesty prevents me from naming them all.) The square on the hypotenuse is equal to the sum of the squares on the other two side. What? Too many numbers? Too many facts? You want to hear about the weather? And the sailors? And who won? Oh geeze, what can I remember? On Saturday the winds were balmy and crafty. On Sunday they were zestier and devious. Splendid lake sailing weather. We had two young (well, younger than me) men from Zim Sailing (our local RS Aero dealer) racing RS Aeros with us. Carson Turowski is the Charter Executive at Zim and Andrew Labbe is a Sales Associate there. I am always pleased when staff from the dealer come out and sail in RS Aero regattas. It shows their commitment to the class – and I am sure it helps them to better communicate to prospective customers what a superb little boat the RS Aero really is. Sally Sharp from New Hampshire, a former New England District Secretary for the Laser Class, joined us on Saturday and proved once again what I am always telling people: if you are a good Laser sailor you can step right into the RS Aero and be competitive right away. Sally, sailing a 7 rig, had a first and two seconds (on handicap) in the six races on Saturday but unfortunately she was not able to join us on Sunday. She promises to come back to Massapoag YC next year. And then there is my nemesis, my arch-rival, Eric Aker. We both bought RS Aeros from the first-shipment into the north-east in 2015 and we have been racing each other in Aeros ever since. And we are (nearly) always close. But at every regatta he always ends up beating me. This year I sailed a 9 rig and he sailed a 7 rig. After 10 races, 3 points separated us and we had identical throwouts. That’s three tenths of a point per race on average. But he beat me. Again. I was fifth overall and Eric was fourth. Grrrrr. Carson Turowski (one of the boys from Zim) sailing an Aero for the first time was third. Hmmm. You have to admire him, but even so… Grrrrr. How are you going to persuade me to buy a new RS Aero if you humiliate me like this? And then there were the top two. Marc Jacobi is the 2017 RS Aero 9 World Champion. He is an amazing sailor, a passionate advocate for the class, and he works extremely hard managing the RS Aero charter fleet at all of our regattas. He was narrowly beaten by Hank Saurage from Lousiana for the RS Aero North American Championship at Newport earlier this summer. At one point Hank was hoping to join us for the event at Massapoag YC and I was looking forward to being able to witness a re-match of these two champions. But, in the end, Hank couldn’t make it. He had to go and try and win the Sunfish Worlds…or his wife wouldn’t let him… or some other lame excuse. So we were all assuming that Marc would have a pretty easy job of winning this regatta. But it was not to be. Alicia Martorella from Long Island sailed a 7 rig in the regatta. I had never met her before, but she told me that she has spent her summers the last few years teaching juniors how to sail and that she has done her racing in the winters with her local Laser frostbite fleet. She had borrowed an RS Aero for a month to check it out. We discovered soon enough that she was extremely smart and speedy on the race course and, after the first day, Alicia was first overall, leading Marc by a few points. On Sunday, I finished near Marc (both us in 9 rigs) in one race and I noticed that after the finish he appeared to be counting the seconds to when Alicia crossed the finish line. “Did she beat you on handicap?” I asked Marc in my usual annoying manner. You would have to ask Marc how he did it, but somehow he raised his game by a notch or two on Sunday and, after the scorer had done her magic with the handicap adjustments, it turned out that he and Alicia were tied on points for overall first place in the regatta, with Marc winning on a tie-breaker. Phew! Thanks to all the volunteers from Massapoag YC who worked so hard to make this regatta such an enjoyable experience for us sailors, especially PRO Gary Werden and his crack race-committee team, and our amazingly energetic Regatta Chair Diane Kampf and all the volunteers who made everything run so smoothly on land. At the end of the day, it’s the people who make this America’s favorite RS Aero regatta. Oops. I almost forgot to mention all the delicious meals served up to us over the weekend. I have never been to a regatta where there was so much food. I suspect that many of that huge swarm of Sunfish sailors we see every year only come for the food. Who can blame them? Full details of the remaining events on the RS Aero North America calendar for 2017 are here. And you can keen in touch on their Facebook Group here.